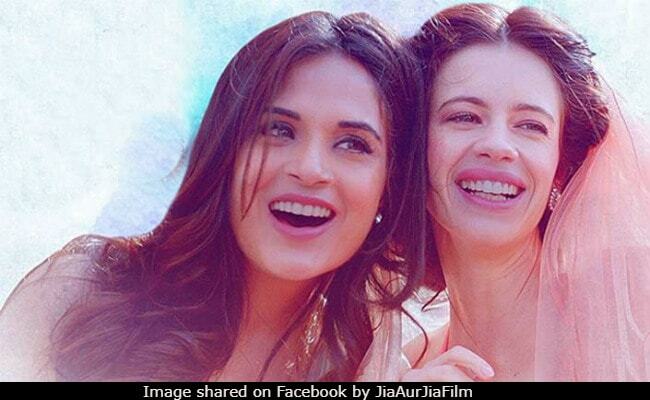 Jia Aur Jia Movie Review: Debutant director Howard Rosemeyer's Jia Aur Jia isn't standard fare. It's substandard. Debutant director Howard Rosemeyer's Jia Aur Jia is a road movie and a terminal illness weepie rolled into one. The result is anything but happy. The film is about two women, two temperamental opposites, looking for common ground in the course of a Scandinavian getaway. The pair of actresses on screen - both have made their names in Mumbai's independent cinema - aren't box-office powerhouses. They do not exactly light up the screen. Jia Aur Jia isn't standard fare. It's substandard. With nary a redeeming feature to liven it up, it is worse than a damp squib. It is a shot in the dark that never emerges into any kind of light. It is inane, tedious and tawdry. Never has a film with a runtime of only 92 minutes weighed so heavy. Each for his own reason, Jia Venkatram (Richa Chadha) and Jia Garewal (Kalki Koechlin), head to Sweden on a twin-share vacation. However, they aren't left alone. Logic is sent on holiday, too. And it limps along by their side all the way through without ever crossing their path and guiding their actions. Here is a sample: they are flying to Sweden but the aircraft that they board is a short-haul one. When it lands, it turns into a wide-bodied plane, an Airbus A380, no less. Factual exactness isn't what this film is interested in. In its attempt to offer a heightened take on female bonding in the face of grave life-and-death challenges, it never gets off the ground. There's more. As the two Jias take their seats next to each other, one of them, a practical prankster, summons a cabin crew member (the director himself appears on the screen in flesh and blood) and requests the latter to let it be known that a fortune teller is available on board for a free consultation. She wants a business class seat for herself and passes off her less-than-enthusiastic tour companion as a soothsayer in order to get a passenger in the front of the plane to move to the back. This sequence sets the stage for all the bunk that follows. Jia Aur Jia moves back and forth without ever hitting the right notes. Even the invocation of the spirit of the peppy Jiya ho jiya kuch bol do, which forms the spine of the background score to begin with and then is sung in the form of a terrible remix during a church wedding, can do little to salvage the film. Jia Aur Jia is a disaster from the very outset because it knows not where it is headed. A script-less blunder, the film lurches aimlessly across nondescript Swedish locations and shoves Kalki and Richa into situations in which they banter and bicker like two unruly schoolgirls. They drink and smoke, ogle at the gora men and drive around in a trailer in search of excitement. They get none. Neither does the audience. One Jia, who owns a bakery in Panchgani, is chirpy and cheerful. The other, a corporate scion with a sad back story, is morose and miserable. They obviously have nothing in common, but both are hugely infuriating. One keeps yakking without rhyme or reason; the other sulks and snaps endlessly. Their antics and utterances are supposed to be comical. They are comical all right, but for all the wrong reasons. This is a film where the line separating the funny from the funereal, and the droll from the dreary, is so thin as to be totally invisible. Spouting cheesy lines and caught in corny situations, the lead duo looks ill at ease - with themselves and the world around them - no matter how hard they try to make sense of this mangled mess of a movie. Why on earth did the two actors acquiesce to be part of such a juvenile exercise? Jia Aur Jia does not even work as a rough-hewn advertisement for Sweden. If the lure of a paid holiday was what drew Kalki and Richa into this deal, the move can only be described as baffling. Stockholm, Kullaberg and Ystad are among the places that are mentioned and probably also shown. But there is no way of being sure - Jia or Jia is such a wavy blur of superficial sensations that nothing actually registers. As far as road movies go, this is a pauper's version of Zindagi Na Milegi Dobara. That apart, Jia or Jia, certainly no Thelma and Louise, is a vanilla avatar of Anand. The eponymous hero in the 1971 classic had cancer of the intestine. One of the Jias has an infected liver. The other Jia is weak-kneed. But where, pray, are the soul and the brain that could drive this film out of the morass? In Sweden, the two run into an Indian lad, Vasu Bergman (newcomer Arslan Goni) - Ingmar must be turning his grave - and go on a wild romp on a beach with him. While one of the Jias lives it up, the other, true to form, looks for a way to end her life. The audience, on its part, wants the film to end. "We are getting a life, baby," the chirpy one exults as the duo starts their Swedish sojourn. Much later in the film, the crabby one gets her own back with "she's got to live." Is the audience moved to tears? No, like everything else in Jia Aur Jia, her purportedly profound statement falls flat. Never has a film about life and death been so spectacularly and so consistently comatose. Hidden behind layers of make-up, the faces of the two actresses communicate nothing of import. Especially out of her depth is Richa Chadha, who has in the past delivered commendable performances. In Jia Aur Jia, she isn't just unconvincing; she is plain bad. Kalki Koechlin fares marginally better, but with the screenplay providing no support at all she, too, is left clutching at straws. Watch Jia Aur Jia only if a road that goes nowhere appeals to you.